(Texte traduit automatiquement) prestigieux appartement bien meublé, au calme, avec vue magnifique sur le Mont Cervin et la Grande-Murs, à partir de condo de ski à pied de la télécabine / télécabine (150 m.), Ben chaises ensoleillées disponibles pour bronzer dans le jardin. Confermo che l'appartamento è in una posizione molto comoda per raggiungere gli impianti di risalita e il centro del paese senza mai dover utilizzare l'automobile. Il condominio è ben tenuto e signorile. L'appartamento è molto confortevole, pulito e ben riscaldato, con una vista splendida sulle montagne. Il bagno e la cucina sono effettivamente nuovi, nessun problema nel fare la doccia in 4 persone con il boiler elettrico, come temevano dopo aver letto una precedente recensione. C'è spazio abbondante negli armadi per riporre gli abiti. Giudizio, quindi, decisamente positivo! Vorrei però aggiungere qualche consiglio per migliorare ancora l'ospitalità. Sarebbe opportuno avvisare gli ospiti che la stradina per arrivare al condominio non è asfaltata e quindi neanche pulita dalla neve. Forse siamo stati un pò ingenui noi e la nostra auto non è dotata di pneumatici da neve, ma dato che tutte le strade principali erano perfettamente pulite, non ci aspettavamo di dover montare le catene per arrivare a casa. Riguardo alla biancheria, che è fornita a richiesta e pagata a parte, ritengo debba essere rinnovata per essere fornita agli ospiti e a pagamento. Le lenzuola del letto a castello erano ok, ma quelle del letto matrimoniale erano molto usurate, scolorite e non stirate, cose, queste, non molto piacevoli quando non si è a casa propria...Questo si può migliorare, il resto ok! 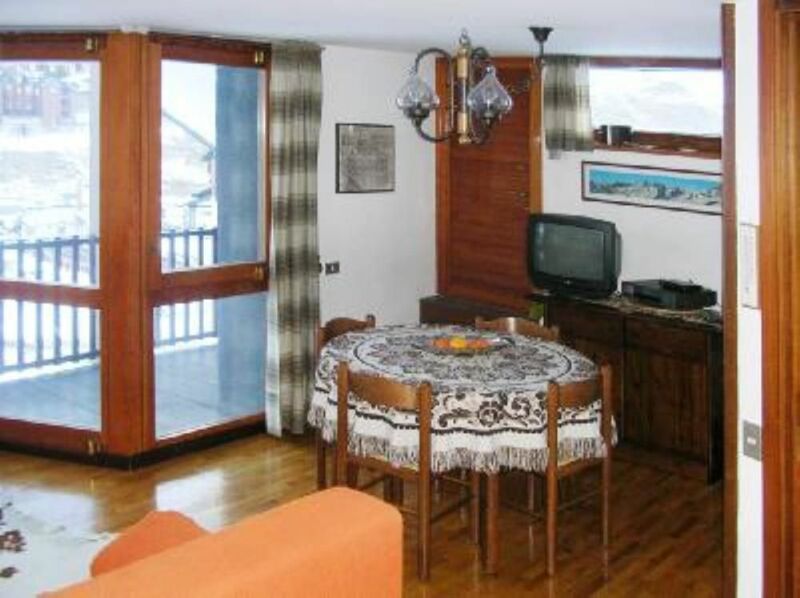 The location of the property is excellent - quite easy ski-in and out to the main lift of the area and just 7-10 min easy walk to the tourist centre of Cervinia - groceries, shops, etc. Good views from the windows and the balcony. It may be difficult finding the property first time - pay attention and study the map in advance. Snow tires or chains are a must on snowy days to get to the property (even after the road is cleaned, driving on a non-winterised car may be a challenge for a less confident driver). The property has an indoor garage, which is a bliss since one doesn't need to clean the snow from the car. The garage is quite small, however - it may not be able to accommodate a full-size car (I had a B-class Mercedes, and it was tight. MB C-class or even something like Audi Q5 might still fit but not larger). Very good communication with the owners. The building concierge is easy to find and they are attentive and helpful. The apartment has a good size for two people. It would be probably tight for more than two people - the second bedroom with two bunk beds is very small, the storage space is very limited, and the common areas are limited too. The kitchen while small is functional with a gas stove top and electric oven. I liked that the kitchen is separated from the main room. The furniture in the apartment is dated but it serves its purpose. I wish that the mattress in the bedroom were of better quality. Pay attention that the property does not have WiFi - it's in the description. My main complaint about the place (perhaps, the owners will take notice) is that the place is stuffed with old and unusable items (cutlery, pots and pans, dinnerware), while it's difficult to find necessary things (I wasn't able to find a second coffee mag, for example). I suggest that the owners clean up everything old and buy a functional set of simple but good quality items - dinnerware and cutlery for 4, 2-3 good knifes, two good skillets, two pots, and other necessary items. I think that this would free the space and significantly improve perception and convenience of the guests. In the end, the property was as described, the owners were helpful and forthcoming, and I enjoyed my stay. Thanks for the review, we will follow the advice given to improve the hospitality of our apartment. The apartment is in a great location close to the lifts and a short downhill walk to the town centre. The apartment has good size rooms. Everything was very clean and it has a modern kitchen and bathroom. Homely and Cosy - a fantastic location! This apartment has everything you need for a great family holiday. There are 4 of us, the kids being 10 and 12. The kitchen is well stocked, the beds are comfortable, the shower is powerful (although probably only enough hot water for two decent showers in one go) and the front room is comfortable. The location is perfect for skiing, even in April, we could walk out of the door and put our skis on and join the piste and then ski home every day. The balcony got the sun until 6pm so we could even enjoy a beer in the sun after skiing! Its only a short walk to town to go out in the evening although after along days skiing we usually enjoyed staying in and chilling out in the apartment. There is no wifi but I thought this was great as I enjoyed my kids company all the more as they were not on devices and you can always find a bit of wifi somewhere if you need it. Susanna was easy to communicate with via text or email and was happy to let us have a late checkout. I would recommend this lovely little apartment to friends and hope to visit myself again. Biancheria da bagno e biancheria da letto sono su richiesta ( costo di € 15,00 a persona ) Proprietario non presente in loco.